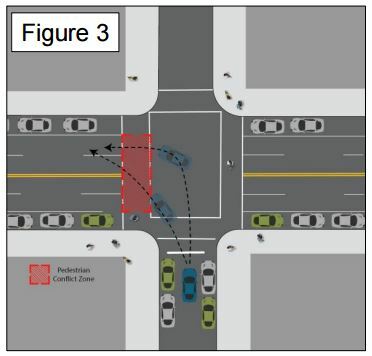 In New York City, left turn accidents account for 19% of the crashes that kill or severely injure (KSI) pedestrians and bicyclists compared to 6% for right turns. At most New York intersections drivers are permitted to tun left while pedestrians are in the crosswalk. While pedestrians have a false sense of security because they are in a crosswalk, left turn drivers often concentrate on on coming traffic while turning and fail to look for pedestrians. Additionally because they can be taken at a wider angle, motorists tend to take left turns at a higher speed than right turns. From 2010 to 2014, 108 pedestrians and bicyclists were killed by drivers turning left in New York City, that’s more than 20 people every year and almost two people every month.